The Real Rabbie Burns featuring The Celts – A concert exploring the life and times of Scotland’s most famous son, poet, song-writer, and raconteur – Robert Burns. This concert’s first season in 2016 was a huge hit! The story itself is amazing:- Burns was much more than the character celebrated annually on Burn’s Day. Colorful, complex, humorous, romantic, in fact just like the show! From love-songs to rebel songs, blazing instrumentals, to sing-a-longs, The Real Rabbie Burns is a tour de force; it is sure to entertain. Much of the story is told in Burn’s own words, from letters he wrote, and it highlights many little-known or perhaps suppressed elements of the man known as Scotland’s Bard. 6-piece band The Celts, which includes World Champion Highland Dancer Daniel Carr are spectacular. Come celebrate Burns’ birthday and experience his songs in the spirit in which he wrote them. 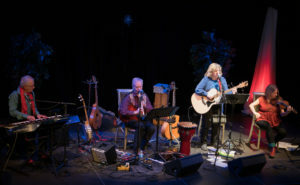 The Celts features Anne Lederman on fiddle and vocals, Nonie Thompson on guitar and vocals, Tom Leighton on accordion and keyboards, Paul Gribbon on Uillean Pipes and whistles, Daniel Carr on bagpipes, and multi-instrumentalist and band-leader Eugene Rea.